The Safest & Most Stable Paramotor Platform Available! Contact us to Order your BlackHawk LowBoy II Quad Today! *2 person powered paragliders do not qualify for the FAA’s FAR 103 in the US. Customers are responsible for checking the applicable regulations where they reside or fly. Rear suspension axles are 1″ thick, and made from extremely strong fiberglass. They can slide into the lower-frame compartment quickly, and make the quad only four feet wide! This allows for easy loading and transport in the back of a truck or trailer. The entire Quad can be quickly disassembled and broken down into suitcase-size, making shipping a breeze. Our New LowBoy II Paramotor Quad provides for the safest and easiest way to launch and fly a Paramotor! A Quad by nature, is 100x safer than any other machine, and it can handle the toughest, most uneven terrain. The benefits of a quad include the capability to maintain stability, even with an off-center glider. The LowBoy II Quad will remain upright on it’s wheels. 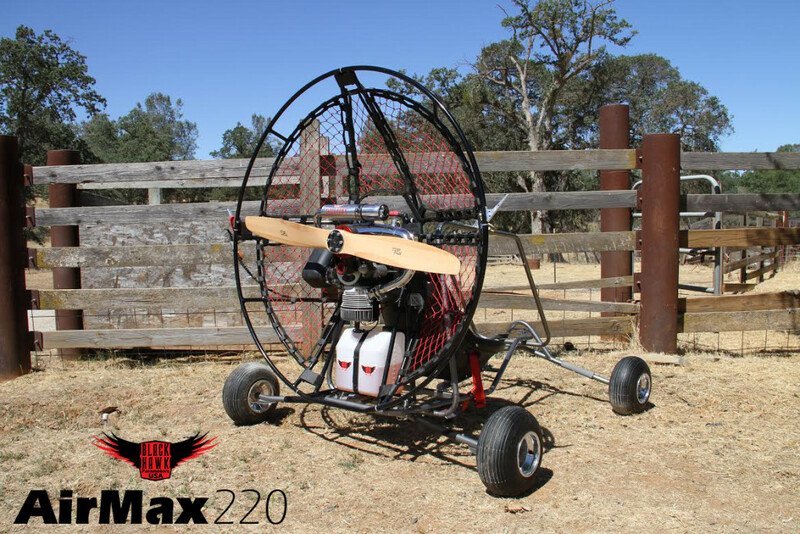 The LowBoy II Paramotor Quad was designed for single or tandem passenger application, and features a very low center-of-gravity for safety. With easy launching and landing characteristics, the LowBoy II is exceptionally safe and FUN to fly! In less than 5-minutes, the entire LowBoy II frame can be easily disassembled for traveling or compact transport. Optional wheeleze balloon tires are available as an upgrade for the new LowBoy II Paramotor Quad. A compatible and versatile design: LowBoy II Paramotor Quads are designed to work with all major brands of Powered Paragliders on the market today. This includes brands like Fresh Breeze, Fly Products, and many more. Best of all, the LowBoy II Quad was designed to be perfectly paired with the BlackHawk HellCat 360, or AirMax 220 Paramotors! As a standard, our BlackHawk Quad Paramotors come with the the Rhino Cage. It’s recommended that for quad application, a 52″ or 54″ prop is used. For more information on available cages, please visit our Paramotor Cages Page. BlackHawk’s NEW LowBoy II Tandem Quad was designed for both tandem and single pilot application. 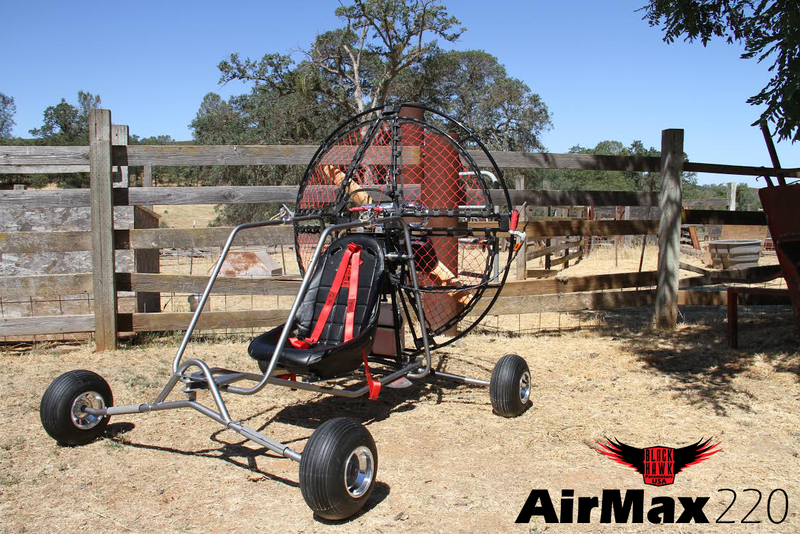 The Tandem LowBoy II Paramotor Quad also features a low center of gravity for safety, a very comfortable bucket-style racing seat (with cover), and a foot-bar installed for the passenger’s comfort. The LowBoy II Tandem Quad features the same easy launching and landing characteristics as the regular LowBoy. This makes it safe and fun to fly with a friend! We have customers call frequently and ask what the difference is between Quads Vs. Trikes. After years of manufacturing gear, instructing students, hundreds of hours in research & design, and many prototype models, we KNOW for a fact that a Paramotor Quad is the safest, most stable, and easiest way to launch a powered paraglider. We have designed our LowBoy Quads with a low center of gravity and to feature a wide wheel base. This makes BlackHawk Quads second-to-none in performance and safety.